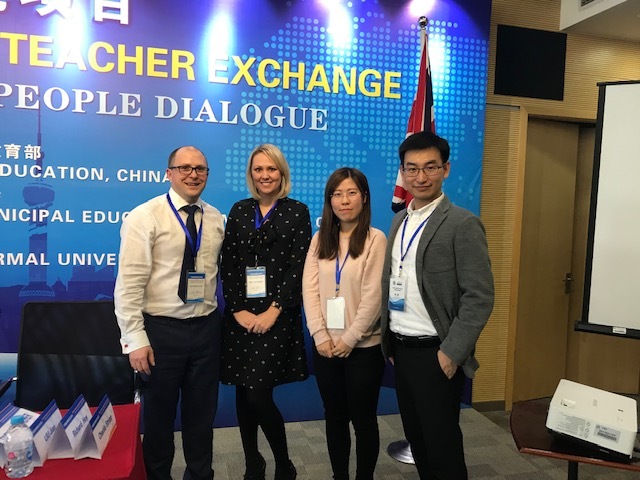 An important part of the Maths Hubs Teaching for Mastery Programme is the annual exchange of teachers between schools in England and Shanghai. Teachers from England spend two weeks observing how maths is taught in Shanghai schools, then later in the school year, they host their partner Shanghai teachers at their own schools in England for a fortnight. When the Shanghai teachers are here, their lessons are observed by teachers from neighbouring schools in every Maths Hub area. In this way, across England, several thousand teachers have been exposed to the successful Shanghai version of teaching for mastery. The two teachers from the Yorkshire Ridings Maths Hub (Emily Crankshaw and Matt Davies) have been in Shanghai for almost a week. They have been fully immersed into school life and have taught a lesson on parallelograms to year 6 along with being filmed by the Chinese equivalent of the DfE! Their partner teachers from Shanghai, Lu and Chen, will be teaching at Northstead Primary School in Scarborough in January. Showcase sessions are running on the 22nd and 23rd January. For details on how to book a place on these exciting events, click below.